A few weeks ago I listened to a talk by John Mutter, a geologist at Columbia University. Mutter has two roles at Columbia. First, he is a geophysist in the Lamont-Doherty Earth Observatory doing traditional research in marine geology and seismology. Second, he is a faculty member in Columbia’s Earth Institute doing research on the links between Earth Science and Social Science. Mutter researches how climate and the natural landscape play a role in determining economic prosperity and social vulnerability to natural disasters. For instance, a country that is located far from the coast and is very mountainous (for instance, some central African countries) have trouble developing because the cost of transporting goods is high, making the development of trade difficult. Similarly, in places where natural disasters occur with high frequency (recurring Earthquakes, hurricanes, tsunamis, droughts, and so forth), societies often have trouble developing. Societies which are already wealthy generally do better in recovering from natural disasters. However, societies which are poor have trouble recovering. If a poor society is unable to recover from one natural disaster by the time the next one hits, then the society may end up on a downward economic spiral. Poor societies often have more trouble recovering from natural disasters because they generally have fewer emergency resources. For instance, poor societies have limited emergency responses such as medics and firefighters. Poor societies may also have limited or no early warning systems and may have less stringent building codes. After a disaster, a poor society may have limited funds to distribute for rebuiling. Most people probably do not have insurance on their houses, boats, cars, and other possessions. All of these factors mean that when it comes to natural disasters and also climate change, the poor suffer more than the wealthy. More people die, more property is lost, and less is done after the disaster. John Mutter’s talk touched on the links between economics and the natural world. He also presented the basics on the differences in how poor and rich societies respond to and recover from natural disasters. However, Mutter’s talk was primarily focused on the recent Hurricane Katrina disaster. Mutter argues that in terms of death toll and damage, the Katrina disaster looked like a poor world disaster. That is, a poor world disaster occurred in an overall wealthy country. Mutter argues, and I tend to agree with him, that Hurricane Katrina should not have happened in a first world country. Too much damage was done, and too many people died. The warnings and evacuation orders came too late, and many people did not have the resources to get out of town. Not enough has been done after the disaster to help New Orleans recover. While affluent neighborhoods and tourist attractictions are largely rebuilt in New Orleans, many of the poor neighborhoods still resemble wastelands. The Hurricane Katrina disaster highlights one of America’s weak points: while an affluent country, overall, there are cities such as New Orleans where extreme poverty remains. As an affluent (well, I manage to live okay off my grad school stipend) white woman living in hoity-toity Cambridge, I can easily forget about these inequities. Aside from a few homeless people I walk by now and then in Harvard Square, I don’t interact with poor people on regular basis– or at least, I’m not aware of it. Similarly, I can easily become wrapped up in my scientific research and forget about people. I really enjoyed Mutter’s talk. First, I really enjoy the interdisciplinary nature of his research. 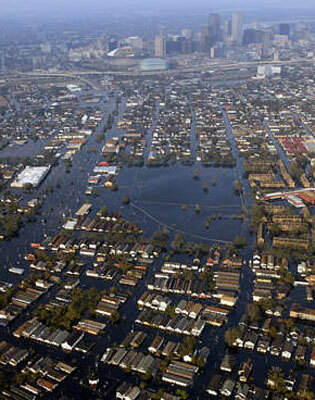 Second, I think the Hurricane Katrina disaster is a good (or bad, perhaps?) way to put a spotlight on some of the economic and social stratifications here in America. America, overall, is a wealthy country. As one forceful hurricane shows, however, America– or at least her poor– is still vulnerable in many ways. Some good points without being preachy. The U.S. is indeed a very wealthy country, with the resources (skilled people, materiel, transportation) to respond to disasters relatively quickly. But we don't have much experience in using those resources in a coordinated, coherent way. A lot of work was and is being done in response to Katrina, but many terrible mistakes were made too, that cost livelihoods, not to mention lives. And now that the immediate urgency is years past, the allocation of resources to aid recovery is becoming stratified, as you noted. Katrina is a wake-up call for the affluent, developed world. Having resources to respond to a crisis is not enough. The planning and use of those resources is the acid test. Now the response is being stratified? Riiight. ShrubCo's "mistake" was figuring "hey, nobody cares about them darkies". Everything else followed from that — damaged and obsolete levees, lackadaisical federal response, toxic spills, abandoned and abused refugees, etc. If not for the oil refineries and ports, I suspect the area would have been written off entirely. It's not "the affluent, developed, world" that needs a wake-up call — most of them were properly horrified by our neglect. This was, and is, America's problem. Second, I think the Hurricane Katrina disaster is a good (or bad, perhaps?) way to put a spotlight on some of the economic and social stratifications here in America. America, overall, is a wealthy country. As one forceful hurricane shows, however, Americaâ€“ or at least her poorâ€“ is still vulnerable in many ways. It's been almost two years, and the poor areas are still a wasteland? Wow. I live in New Orleans and had to evacuate ahead of Katrina. I was very fortunate that my property was not damaged and my place of employment was fine. But I see the ongoing, excruciatingly slow recovery every day. Yes, 19 months later, there are still many businesses not reopened, and still many people waiting for insurance and our government to help them return to rebuild their homes. This is just one more atrocity to pin on Bush's government. And of course there were those who claimed Katrina was the wrath of god, punishing the debauched. Yet Bourbon Street is high and dry. The main damage and deaths occurred among the impoverished, God-fearing communities. If you missed Spike Lee's <a>"When The Levees Broke: A Requiem In Four Acts" it's worth tracking down.